‪Here at The A.V. Club, we repeatedly come back to praising patience, particularly when it comes to resisting the idea that ease and immediacy of access is the most important factor in choosing entertainment. As we’ve said in past columns, watching TV at a measured pace instead of cramming it down in marathon sessions has its own pleasures. Holding out for watching something specific and terrific instead of accepting whatever’s available on streaming is a way to avoid watching a lot of mediocre media. Waiting until quality TV is available for legitimate purchase is an excellent way to ensure networks will keep making quality TV. And while industry wars over streaming rights are making it harder to instantaneously access anything and everything we want the very second it’s released, that just provides a chance to slow down, explore back catalogs, and discover the vast well of film and TV history, instead of solely focusing on what’s newest, and demanding it be made available right the hell now. But “right the hell now” is increasingly becoming the default standard of worth, driving consumers toward streaming video, downloadable purchases, subscriber-based online music services, and piracy—anything that lets us get access to something the moment we decide we want it. And physical media have been devalued in response; every week brings a new report about declining DVD sales, or an op-ed on how the death of discs is no big deal, or a news story about Netflix CEO Reed Hastings trying yet again to ditch his company’s support of the physical format. That makes perfect sense for Netflix, which doesn’t want to pay rising postal costs to ship physical discs, and salaries for all the people involved in pulling them out of return envelopes and shoving them into delivery envelopes, and replacement costs for discs broken in the mail, and all the other costs associated with physical media. Easier to just maintain a bunch of servers full of data, and not worry about, for instance, organizing, storing, and filing thousands of discs that never get rented, but that the company keeps in stock (for now) in the name of maintaining a competitively deep selection. I’m not entirely ready to give up on discs yet. I realize this makes me sound like a grumpy Andy Rooney stereotype, bitching about kids today and their inexplicable electronic doodads. Or Jonathan Franzen griping that the impermanence and malleability of e-books compared to paper books is “not compatible with a system of justice or responsible self-government.” Or, more appealingly than either of those options, AVC film editor Scott Tobias waxing nostalgic about how much he’s going to miss celluloid when the medium is phased out entirely. But unlike Franzen and Scott, I don’t have an emotional connection to a medium. I’m just surprised at people’s ongoing willingness to accept convenience over quality. Physical media are still more portable and readily accessible than streaming media. In the past year or so, I’ve watched DVDs or Blu-rays in a wilderness cabin, on a plane, on a cruise ship in the middle of the ocean, and at resorts in Mexico and the Bahamas—all places where I couldn’t get wi-fi access or even cell-phone reception. I’ve loaned DVDs to friends and taken them to parties without having to burn discs, swap drives, or mourn the death of Megaupload. Bringing a Blu-ray to a relative’s house for family holidays or vacations, I never have to worry about whether their Internet connection is as good as mine, or whether they have an account on the service I want to reach, or a Roku/DVR/PS3/etc. that can access that service, or the right cables to hook my computer into their TV. For that matter, I don’t have to worry about whether high demand for online video on the holidays will cause slow streaming times, quality drops, or complete outages, as happened to Netflix over Thanksgiving 2011; I can reliably watch a DVD no matter how many other people are watching copies of that DVD at the same time. I don’t have to worry about how to store dozens or hundreds of multi-gig HD video files, or how to keep them backed up in case of drive failure. And I don’t have to worry whether my Internet provider or my friends’ and relatives’ providers have reacted to the increased demand for streaming media by throttling data, establishing media caps, or simply raising prices. Physical media still provide surety, where electronic media remain an “If everything works…” proposition. And then there’s the fact that DVD/Blu-ray selection is still far greater than streaming selection. For example, check out this comparison list from September 2011, showing that only about a fifth of the movies on the IMDB top 250 are available via Netflix streaming—a percentage that dropped recently with the lapse of the Starz deal. Or consider Netflix’s Alfred Hitchcock library: More than 40 films available on disc, but only six available on Netflix Instant, and only two of those (The Lady Vanishes and The Man Who Knew Too Much) among his classics. Not only is any given film still far more likely to be available in disc form, those discs are still more likely to have options like subtitles, alternative languages, and disc extras. Many of these issues are already getting better over time. Infrastructures are improving to handle increased streaming demand. Netflix has been adding subtitles to its streaming films and shows. The visual resolution and audio quality of downloadable files has steadily increased. The situation with disc extras has gotten complicated, with some companies eliminating extras from rental discs, and some making extras available for download, and some just de-emphasizing extras altogether, such that it doesn’t matter what format you prefer. Things are getting better for downloadable and streaming media, and that’s terrific. I’m not advocating an eternal commitment to physical media, so much as an acknowledgement that it has its advantages over streaming at the moment. But as people become more dependent on cloud-based media, one aspect of the industry is only likely to get worse over time: the question of ownership. One advantage of owning an actual Blu-ray disc is that I still have access to the contents even if the studio that released it loses the rights or goes out of business. We’ve seen cases over and over where people who think they’ve paid for content and have permanent access to it lose that access, whether it’s Amazon remotely deleting unlicensed books from people’s Kindles or Netflix removing around a thousand titles from its streaming library a few days ago as its contract with Starz ended. As more players enter the streaming market and early leaders like iTunes and Netflix lose access to content, it will only become harder to figure out who currently holds the rights to a given show or film, and which service is showing it legally, if it’s available online at all. Granted, the ownership argument only applies to purchased media, and the counterargument there is that no one needs to buy every movie they want to see at home. (It’d be ridiculous for a critic who routinely gets free discs to insist that other people should buy them as often as possible to keep the medium alive.) A lot of films don’t warrant multiple viewings, and it’s hard to justify the expense of a DVD for something that will only get watched once. Streaming is useful for a try-before-you-buy experience, or an intentionally ephemeral one, like catching up on Saturday Night Live sketches that may never turn up on DVD. And Hulu or an Amazon download is a good alternative to cable for someone who wants to check out Smash while the conversation about it is still fresh. Physical media do have downsides. Purchased discs take up storage space. Rented discs require viewers to wait a day or two for mail delivery, or get off their butts and physically travel to the video store or the Redbox or Blockbuster kiosk. The monthly subscription to any one streaming service is low compared to the price of a Blu-ray, and that streaming service is likely to provide a lot more entertainment over the course of a given month. 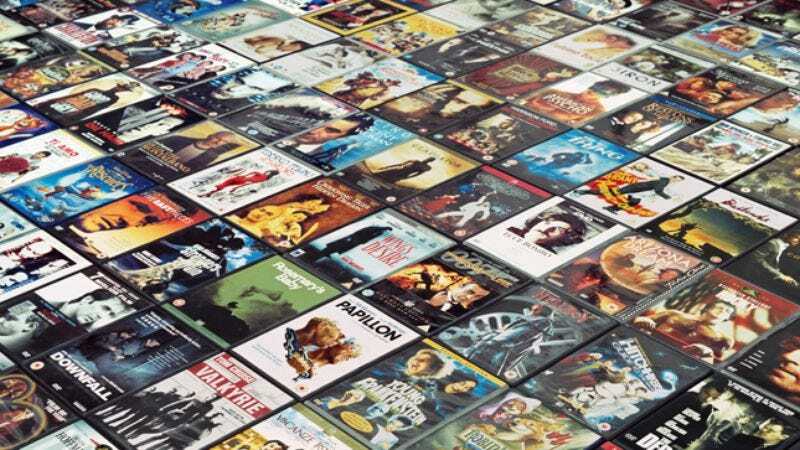 Perhaps most crucially, streaming services in their current form are more likely to try to offer a lot of access for a little money, whereas Blu-ray distributors in particular seem more and more driven by a desire to upcharge consumers in exchange for things they don’t necessarily need—for instance, the cheapest option for the Hugo Blu-ray is a $45 package that comes bundled with a DVD copy and a digital copy. Marketing ploys like that may kill physical formats faster than streaming services do. But mostly, I worry that the whatever’s available right the hell now philosophy—the convenience trap, as Sam Adams put it in his essay linked in the first paragraph above—is sending the wrong message to the companies that distribute entertainment. That message is that viewers don’t care about portability, accessibility, visual and audio quality, selection, or ownership, and that improving these aspects of the streaming experience doesn’t need to be a priority. I worry that knowing about the convenience trap frees companies to stick with lower-resolution downloads, pursue the dream of cloud-based “ownership” where the company has more control over the media than the purchaser, and only chase whatever streaming rights are cheapest and most easily accessible, figuring that many people will settle for Parks And Recreation on Netflix now that Party Down isn’t available, and might subsequently settle for How I Met Your Mother, or hey, Two And A Half Men, if Parks And Recreation becomes unavailable as well. And how far does that extend? Going back to Hitchcock on Netflix, is an instant stream of The Manxman really an acceptable substitute for waiting a day for a rental disc of Vertigo or Psycho? So for me, hanging onto discs isn’t about sentiment, a Luddite fear of technology, or even protecting a hefty financial investment in an aging medium, as so many people do whenever the market-dominating format in an industry changes. It’s a way of voting with my feet, or with my wallet. By saying, “I’ll fully switch over to streaming when it looks and sounds as good, feels as stable, and provides as much library depth as disc options do,” I’m encouraging streaming companies to prioritize improving those things. Because media conglomerates don’t care about sentiment, and won’t hold back on progress to comfort the timid. But they do care about where people are spending money. Reed Hastings and Netflix apparently figured that out recently, given that they just quietly brought back the DVD-rental-only sign-up option for new customers. Media companies have every reason to not passively wait to see what consumers want, and to try to drive the market to places that will be more profitable and less expensive for them. And they simultaneously have every reason to drive people to value only the newest releases, and the most readily available content. They want purchasers to care about “new and now” because ideally, they want to sell you something new, right now—every minute of every day. But consumers have every reason to fight back against being manipulated, and to hold out for improvements to a patchily available, visually inferior, limited-library product. In a widely read CNET article, media industry-watcher Eric Garland theorized in 2011 that Reed Hastings’ attempts to kill Netflix’s disc-rental service are actually an attempt to kill the DVD format—in order to drive more studios to license their products for streaming services. “He’s trying to remove the complacency that comes from an easy dependency on that legacy product,” Garland said. But hanging onto discs doesn’t necessarily imply complacency. It could just as easily be the grimly determined act of consumers waiting for the Next Big Thing to become as good as the Last Big Thing, and not jumping ship until we get to a harbor that looks as secure, stable, and welcoming as the one we just left.